Friedrich Wilhelm Joseph von Schelling (January 27, 1775 - August 20, 1854) was a German philosopher and one of the three great representatives of German Idealism. A brilliant but restless mind, Schelling is the philosopher most directly identified with Romanticism and the spirit of the German “Sturm und Drang” (Storm and Stress, a pre-romantic literary movement). Though he was born five years prior to Hegel and lived more than twenty years longer, Schelling is rightfully considered to be chronologically the second of the three major German idealists, after Fichte and before Hegel, because his career began and bloomed earlier than that of Hegel and started declining when the latter gained undisputed predominance. Schelling is also the second in the sense that his idealist speculation, centered on the notion of the Absolute, represents a step beyond that of Fichte, without reaching the scope of Hegel’s system. Schelling is in some ways uncharacteristic of German Idealism through his tendency to value the inner life of emotion and spirituality above the rationalist discourse, as can be seen from his philosophy of art and especially the philosophy of religion of his last period. Thus, besides displaying the qualities and defects of idealistic speculation, Schelling offered a valid contribution to the study of religious and artistic consciousness. Schelling was born at Leonberg in Württemberg. He was first educated at the cloister school of Bebenhausen, near Tübingen, where his father was chaplain and an Orientalist professor. Three years early, he then enrolled at the Tübinger Stift (seminary of the Protestant Church in Württemberg), where he became friends with Georg Hegel and the poet Friedrich Hölderlin. In 1792 Schelling graduated from the philosophical faculty, and in 1795 he finished his thesis for his theological degree. Meanwhile, he had begun to study Kant and Fichte. Fichte’s early writings on the Wissenschaftslehre greatly influenced him. Schelling had no sooner grasped the leading ideas of Fichte's amended form of the critical philosophy than he eagerly put together his impressions of it in his Über die Möglichkeit einer Form der Philosophie überhaupt (1794). Although unoriginal, his work showed such depth of appreciation for the new ideas of the Fichtean method that Fichte himself acknowledged it, and immediately made for Schelling a reputation among philosophical writers. His more elaborate work, Vom Ich als Prinzip der Philosophie, oder über das Unbedingte im menschlichen Wissen (1798), while still remaining within the limits of the Fichtean idealism, exhibited unmistakable traces of a tendency to give the Fichtean method a more objective application, and to amalgamate Spinoza's views with it. At only 23 years of age, Schelling was called as an extraordinary professor of philosophy at Jena in midsummer 1798. He had already contributed articles and reviews to the Journal of Fichte and Niethammer, and had thrown himself with characteristic impetuosity into the study of physical and medical science. Schelling’s Briefe über Dogmatismus und Kritizismus, an admirably written critique of the ultimate issues of the Kantian system date from 1796, and from 1797 the essay entitled Neue Deduction des Naturrechts, which to some extent anticipated Fichte's treatment in the Grundlage des Naturrechts. His studies of physical science bore rapid fruit in the Ideen zu einer Philosophie der Natur (1797), and the treatise Von der Weltseele (1798). While at Jena (1798-1803), Schelling’s intellectual sympathies united him closely with some of the most active literary figures of the time including Johann Wolfgang von Goethe, who viewed with interest and appreciation the poetical fashion of treating fact characteristic of the Naturphilosophie. He soon became the acknowledged leader of the Romantic school whose impetuous representatives had begun to tire of the cold abstractions of Fichte. In Schelling, essentially a self-conscious genius—eager and rash, yet with undeniable power—they hailed a personality of the true Romantic type. With August Wilhelm von Schlegel and his gifted wife, Karoline&mdash:herself the embodiment of the Romantic spirit—Schelling's relations were very intimate. Eventually, Schlegel divorced Karoline and in 1803 Schelling and Karoline were married. Schelling became involved in a series of disputes at Jena, which led to his departure. From 1803 until 1806 Schelling was professor at the new University of Würzburg. This period was marked by considerable flux in his views and by a final breach with Fichte and with Hegel. He then moved to Munich in 1806. He also lectured for a short time at Stuttgart, and seven years at Erlangen (1820 - 1827). In 1809 Karoline died, and three years later Schelling married one of her closest friends, Pauline Gotter, in whom he found a faithful companion. During the long stay at Munich, Schelling's literary activity gradually came to a standstill. The only writing of significance from this period is the "Philosophische Untersuchungen über das Wesen der menschlichen Freiheit (1809), which carries out, with increasing tendency to mysticism, the thoughts of the previous work, Philosophie und Religion. Schelling began to express his antagonism to the Hegelian system. He also began his treatment of mythology and religion which in his view constituted the true positive complements to the negative of logical or speculative philosophy. Public attention was powerfully attracted by these vague hints of a new system that promised something more positive, especially in its treatment of religion, than the apparent results of Hegel's teaching. The appearance of the critical writings of David Friedrich Strauss, Ludwig Andreas Feuerbach, and Bruno Bauer and the disunion in the Hegelian school itself had alienated the sympathies of many from the then dominant philosophy. In 1841, Schelling was appointed at the University of Berlin, the headquarters of the Hegelians. Among his students there were Søren Kierkegaard, Mikhail Bakunin, and Friedrich Engels. A large and appreciative audience listened to the opening lecture of his course, but in 1845 he ceased the delivery of any public courses. No authentic information as to the nature of the new positive philosophy was obtained until after his death at Bad Ragatz on August 20, 1854, with the issue of the first volumes of his collected writings. Schelling emphasizes the oneness in this process by borrowing Spinoza’s terminology of “natura naturata” and “natura naturans”, i.e., nature as it is created and nature as it creates. To describe the process, he uses the term of “potencies” (Potenzen) of nature. The first and lowest one corresponds to the material bodies and movements of nature. The second potency consists of the same forces at work on a higher level, e.g., magnetism and electricity. The third potency corresponds to living organisms, culminating with the human organism. The general idea is that in nature the Absolute gradually expresses itself in an ascending pattern consistent with the notion of evolution through creative design, but one that is not imposed from the outside. Here, we have the same dialectical pattern as with Fichte and later Hegel. Unlike Fichte, however, Schelling does not try to reduce the entire process to a function of the Ego. Like him, he postulates intellectual intuition but the general scope of his speculation is wider, since he moves further away from a phenomenological description of self-perception to create an overall vision. That vision makes sense, but it is remote from any empirical verification or logical description: for him, the Absolute can only be perceived through intellectual intuition and is beyond any logical formulation – something Hegel would vehemently object to. Finally, Schelling goes on to describe the way in which this process culminates in endless progress with the constitution of a world state consisting of a federation of states (somewhat reminiscent of Kant’s vision for perpetual peace). In his mature years, Schelling developed a philosophy of art that for him was to be the culmination of his transcendental idealism. This emphasis on art is typical of Schelling’s involvement with Romanticism and it shows the influence of Novalis and A.W. Schlegel. Unlike Schopenhauer’s philosophy, where art serves as a temporary relief and liberation from the sufferings of this world, in Schelling’s system art represents the culmination or completion of the Absolute’s manifestation. For Schelling, art’s productive intuition is an outward-oriented equivalent of philosophy’s inward-oriented intellectual intuition. Through this correspondence, beauty and truth are seen to be ultimately one. In his Bruno (1802), referring to Giordano Bruno, Schelling further introduced Platonic and Neo-Platonic elements, saying that the beauty of things is due to their participation in divine ideas. In the more than 20 years by which Schelling outlived Hegel, he was not really able to capitalize on the rapid loss of standing of his illustrious rival. For this, Schelling’s own system was far too inconsistent. However, with his philosophy of religion, he did offer significant contributions that go beyond the speculative method of German Idealism and, in some way, bring him into close contact with the existentialist approach. In particular, Schelling came to see the cosmic human fall as coinciding with creation as an alienation from the center. His key influence in this late period was the medieval mystic Jakob Boehme. Schelling, in turn, would be a significant influence on the development of religious studies, based on his discussion of religious consciousness. Schelling’s philosophy of religion in particular had a deep influence on the young Paul Tillich, though he quickly came to reject the speculative aspect of it. Still, Tillich also stated that Schelling’s words on the subject were perhaps the deepest ever spoken by anyone, and even in his later work the influence of Schelling remains evident. In response to Hegel’s criticism of his philosophy as vague, Schelling makes the distinction between positive and negative philosophy, the latter (e.g., Hegel’s system) being merely discursive and unable to grasp the essence of the absolute. Positive philosophy, on the other hand, implies the recognition of God as a personal being acting through history. The last theme that came to preoccupy Schelling in the more religious period of his later years was that of mythology and revelation. Schelling saw mythological themes as the empirical verification of his metaphysical theory of the absolute and its genesis in the unconscious. For him, myths were an early, still unconscious historical manifestation of the absolute, while Christian revelation represented the free, intentional expression of a later stage. In his The Deities of Samothrace (1815), Schelling interprets the function of ancient Greek deities as that of precursors to the full manifestation of God. In spite of his considerable scholarship, his specific conclusions—meant to support his preconceived ideas—are not taken seriously. Neither is much of his Gnostic vision reminiscent of Joachim of Flores “Age of the Spirit.” But his understanding that the development of the religious spirit does not proceed from rationality but from an unconscious process originating in the abyss of Being (the “Urgrund”) has had repercussions in modern psychology. Schelling’s notion that myths are not the product of a rational mind but that of a much earlier unconscious activity can be seen as a precursor to Carl Gustav Jung’s archetypes. Even more than that of Fichte, Schelling’s philosophy underwent numerous changes. Schelling has been a source of inspiration for many, rather than the initiator of any particular school of thought. To paraphrase Karl Jaspers’ words, the protean philosopher’s magic serves as a door to the many possibilities and dangers of contemporary philosophy. It is a prototype giving a glimpse of future potential, rather than a fixed model. Whatever judgment one may form of the total worth of Schelling as a philosopher, his place in German philosophy is unmistakable and assured. It happened to him, as he himself claimed, to turn a page in the history of thought—and one cannot ignore the actual advance upon his predecessor achieved by him or the brilliant fertility of the genius by which that achievement was accomplished. On the other hand, he does not succeed in attaining to a complete scientific system. His philosophical writings are the successive manifestations of a restless highly endowed spirit, striving somewhat unsuccessfully after a solution of its own problems. Its unity is one of tendency and endeavor. At all stages of his thought, Schelling called to his aid the forms of some other system. Thus Fichte, Spinoza, Jakob Boehme and the mystics, and finally, the great Greek thinkers with their Neoplatonic, Gnostic, and Scholastic commentators, give coloring to particular works. the opposition of negative and positive philosophy, an opposition which is the theme of the Berlin lectures, though its germs may be traced back to 1804. Selected works are listed below. For a more complete listing, see this page. Über die Möglichkeit einer Form der Philosophie überhaupt (1794) ("On the Possibility of an Absolute Form of Philosophy"), Vom Ich als Prinzip der Philosophie oder über das Unbedingte im menschlichen Wissen (1795) ("Of the I as the Principle of Philosophy or on the Unconditional in Human Knowledge"), Philosophische Briefe über Dogmatismus und Kriticismus (1795) ("Philosophical Letters on Dogmatism and Criticism") in The Unconditional in Human Knowledge: Four early essays 1794-6 (1980) translation and commentary by F. Marti, Lewisburg: Bucknell University Press. Philosophie der Mythologie (Philosophy of Mythology – Lecture) (1842). Philosophie der Offenbarung (Philosophy of Revelation – Lecture) (1854). 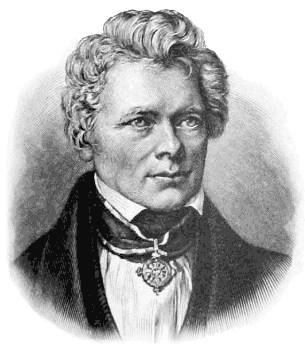 History of "Friedrich Wilhelm Joseph von Schelling"